Farmers all over the Mendips made cheese and legend has it that, in these pre-refrigeration days, they would mature it in the caves that can be found all over the hills. 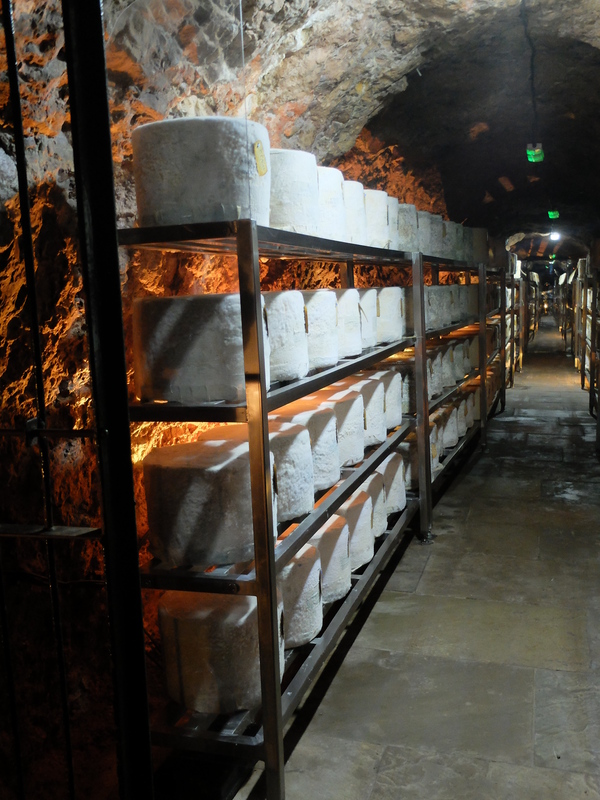 With their high levels of humidity and constant temperature of 11°C, caves are the perfect place to mature cheese without it becoming dry. 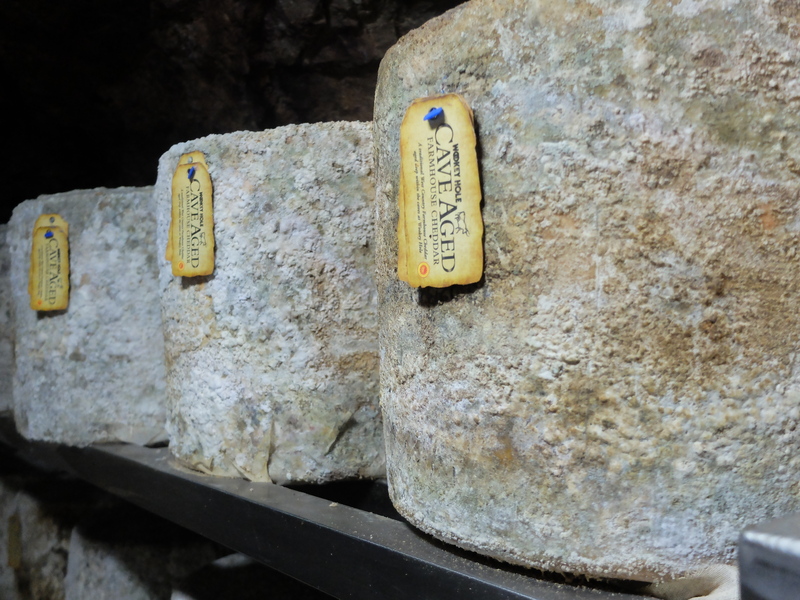 In 2006, Ford Farm, based down in Dorset, revived the practice, taking their traditional Cheddar to the Wookey Hole caves. You can see it through some formidable metal gates if you take a tour of the Caverns but I was lucky enough to be taken via a secret entrance – skirting some dinosaurs and a hall of mirrors – right to where some ten tonnes of the cheese sits, 200 feet underground, glowing eerily under coloured lights. Ford Farm’s Cheddar has PDO status as a West Country Farmhouse Cheddar (there is no PDO for Cheddar generally, hence why it’s produced all over the world). The truckles – each of which weigh in at a hefty 27kg – must therefore be matured for a minimum of nine months. Once the cheeses are turned out of their moulds, they’re bandaged and wrapped in lard, a traditional pre-vacuum-pack practice which prevents cheeses from drying out and losing too much weight. Cheddar made in this way is a dying art form; just 1,500 tonnes of it is produced a year by a handful of farms, representing a tiny percentage of overall cheddar production. The cheeses are matured for around nine months at Ford Farm, where a cheese grader continually checks them for taste and texture. 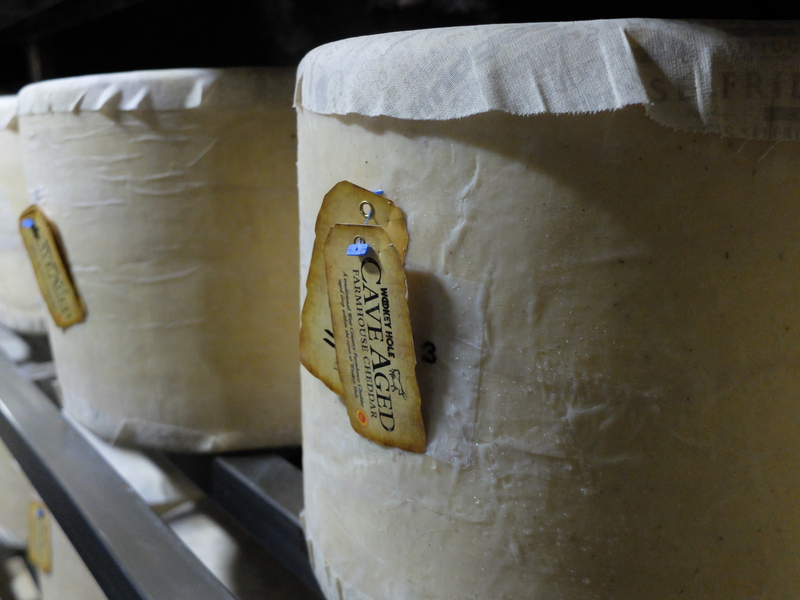 The best cheeses are then transported to the caves where they age for anything up to another six months. They’re cosseted beasts, checked daily to ensure they are developing properly and that cheese mites haven’t taken up residence (they’re blasted with a blow torch if they’re spotted). 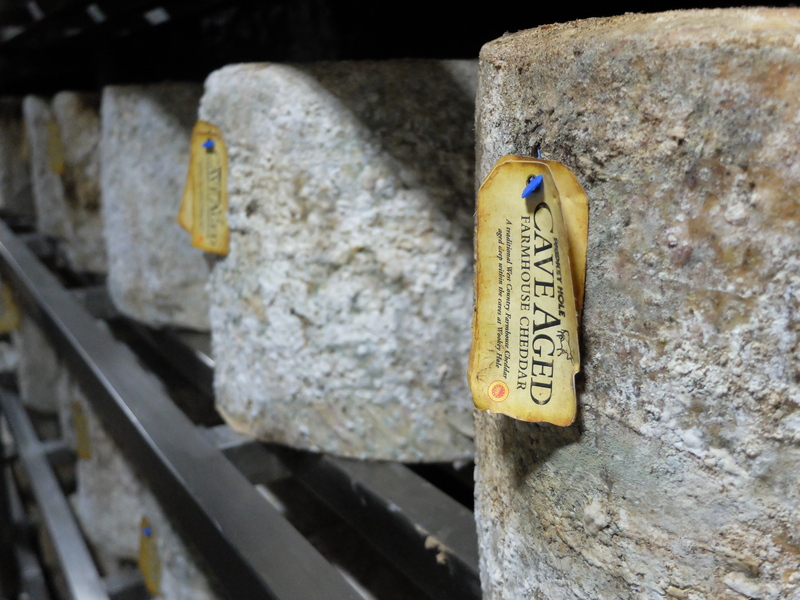 The cheeses develop a fantastic mottled mould on their cloths that makes them look as if they’re carved from granite and peppered with lichen. The caves don’t just make the cheese look pretty though; the cheese takes on the flavour of its surroundings as it matures, in this case from a damp, cold rockiness. Mike Pullen, the Managing Director of Ford Farm, ironed various truckles for us to taste (and if this sounds like he flattened them, learn that a cheese iron is used to bore into the centre of a truckle to extract a cylinder of cheese for tasting). The different ages of the cheeses give subtle variations to their taste and intensity, with the older ones taking on an earthy complexity alongside the creaminess of the cheddar. 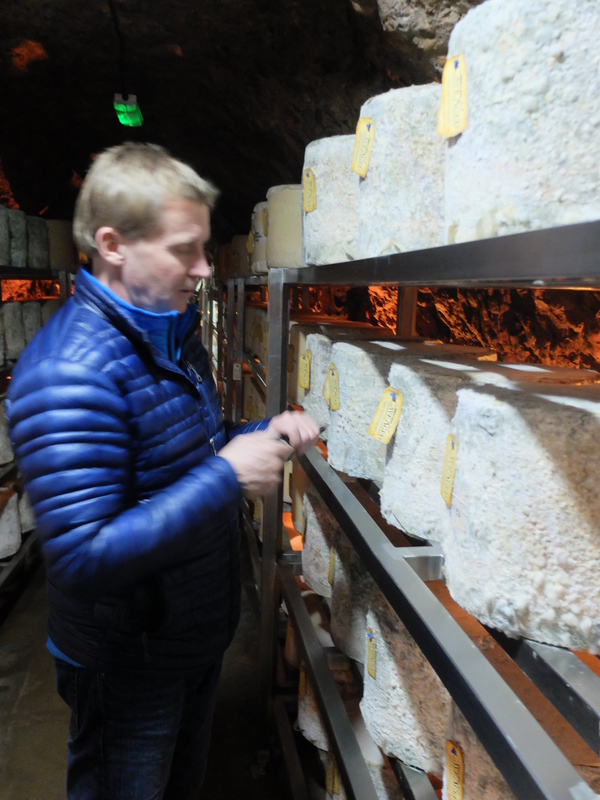 Cave-maturing is a strategy that’s paid off, as the cheese has proved to be a big success story, achieving Supreme Champion at the 2011 International Cheese Awards (the cheese equivalent of ‘Top Dog’ at Crufts). It’s exported as far afield as Hong Kong, Australia and Kenya and one Lincolnshire fan even gets his Christmas order in every January so as not to miss out. It’s thought that basic cheese-making began as early as Prehistoric times so who knows what’s next – perhaps some cheese-making in the shadow of nearby Stonehenge? With thanks to Ford Farms for showing me around their cheese caves. You can’t beat a good cheddar. 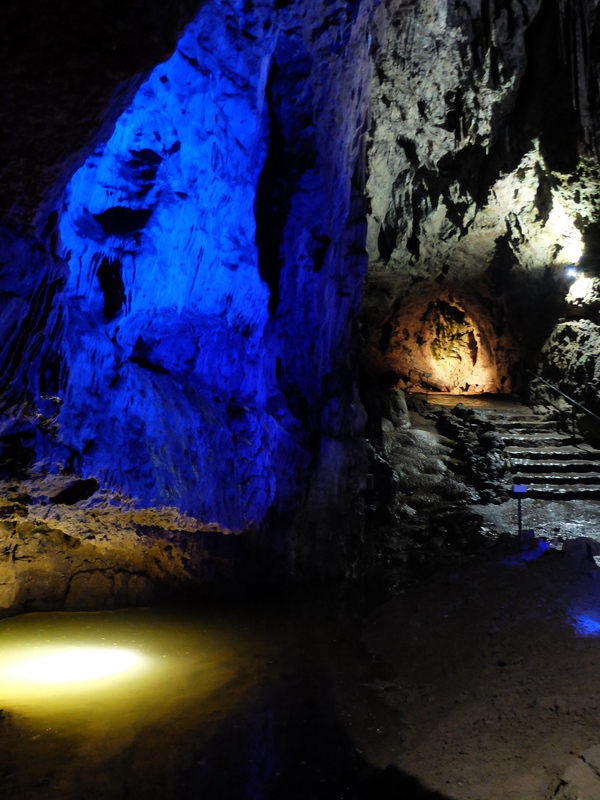 I’d love to visit the cheese caves – which sounds like something from the Clangers. Is there a soup dragon? Arf! No but there is a witch who I believe gets paid rather handsomely (not in cheese though, alas). Such a pretty way to store cheese. When you hear cave you think dark and gloomy. Not here though. Sure wish I could try it! I think they export quite a lot of it – so you never know! Your tales at the beginning of the post may not be so far fetched. When I was small (in London), my mother would always leave milk out to sour when thunder was expected, and then make a simple curd cheese. I can’t get milk to sour in the way it used to: pasteurisation or something I suppose. That’s interesting! I did quite a lot of research into Cheshire Cheese and one theory as to why a lot of it now is white and acidic is that in the late nineteenth century a bout of thundery weather produced such cheese that the Lancashire mill-hands really liked, so they then managed to replicate the cheese and sold huge amounts of it. Not sure how much of that is true either (!) but a cheese-maker did tell me that thunder can affect the milk composition, so your mother was definitely onto something.